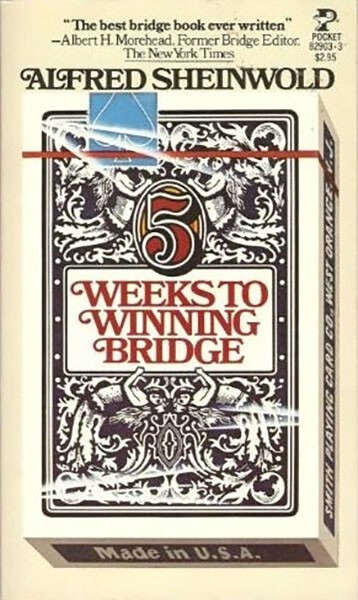 Five Weeks to Winning Bridge is the book most frequently recommended and most often read by beginning bridge players. It is divided into 35 chapters, one for each day of the week over a seven week period. Each chapter is about 15 pages long, enough for a new player to read and absorb in a day. Thus, at the end of 35 days or 5 weeks, the reader should be a competent bridge player. This book describes the Standard American bidding system. Although still the most widely known system, there have been a proliferation of bidding systems. The reader should be prepared to play under other systems. The reader should be aware that this book primarily describes Rubber Bridge play. Nowadays, most bridge play is duplicate. In spite of these developments, this book remains the one more players start off with than any other book. Thus, it should be required reading for all bridge players. If offers the clearest and most easy-to-read description of bridge. Alfred Sheinwold was born on January 26, 1912. He was an American bridge player, administrator, international team captain and prolific author of books about bridge. He was, with Edgar Kaplan, co-developer of the Kaplan-Sheinwold bidding system. Among other administrative assignments that he accepted, Sheinwold chaired the American Contract Bridge League (ACBL) National Laws Commission from 1964 to 1975, and the ACBL Appeals Committee from 1966 to 1970. He also was the Editor of the ACBL Bulletin from 1952 to 1958. Sheinwold was born in London, England and emigrated to the United States as a young man. He soon became well known as a bridge writer and editor, and started work as an editor for Ely Culbertson's magazine, The Bridge World, in 1934, where he held the posts of technical editor, then managing editor, and then senior editor. After Edgar Kaplan purchased The Bridge World, Sheinwold became one of four expert members on the rotating directorship of the Master Solvers Club, from 1967—1980. During WWII, Sheinwold interrupted his bridge career to serve as Chief Code and Cipher Expert in the Office of Strategic Services for the United States. During the period of the development of the Kaplan-Sheinwold bidding system, Sheinwold was particularly successful in national level tournament bridge in the United States. He won the Chicago event (subsequently known as the Reisinger) in 1958 and the Spring National Men's Teams in 1964, was on the runner-up team for the Vanderbilt (also 1958), and had many regional wins. Sheinwold was often sought as captain by US teams that were pursuing national and international championships. He captained the 1985 US team that won the Bermuda Bowl, and also the 1975 US team that placed second in the same event. Sheinwold is best known for his syndicated newspaper column, which ran for more than 30 years. He also prepared the AutoBridge hands and discussions, and authored Five Weeks to Winning Bridge, which has sold more than a million copies. He was principal author of The Kaplan-Sheinwold System of Winning Bridge, the first extended description of the Kaplan-Sheinwold bidding system. Sheinwold's smooth, encouraging writing style made him the most popular bridge author of his time. Sheinwold died of a heart attack in Sherman Oaks, California on March 8, 1997 at the age of 85.